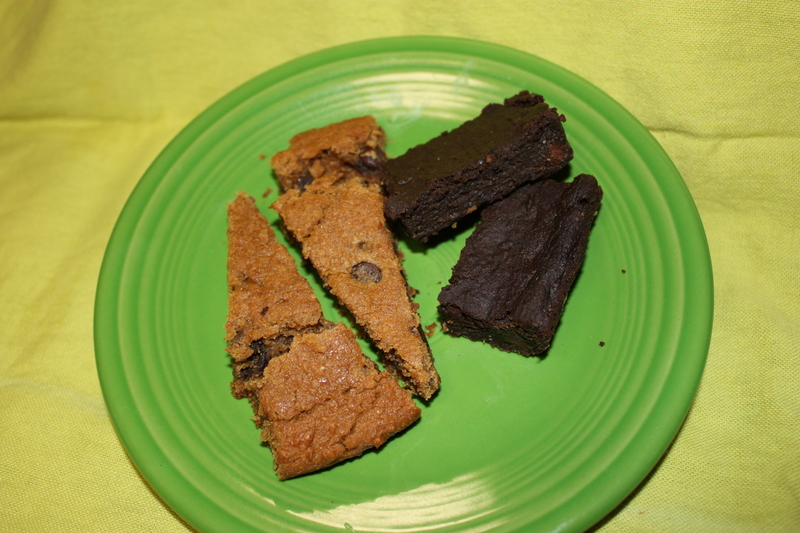 I was immediately intrigued when I was reading a blog about food made out of beans … brownies and blondies seemed like the obvious recipe to try first. You should definitely try these out in your own kitchen … especially if your name is Laurel Alderfer-Dean! 🙂 What could be better than a dessert that is low in saturated fat & high in fiber & gluten-free?? Preheat oven to 350 degrees. Blend all ingredients (except chips) until very smooth in a food processor (not a blender). Mix in chips, and scoop into a greased (or tinfoil-lined) 8×8 pan. Optional: for “prettiness” you can stick some chocolate chips on top of the batter as well. Bake for around 30 minutes. They’ll look a little undercooked when you take them out, but they firm up as they cool, and you don’t want them to get hard. Preheat oven to 350 F. Grease an 8×8″ pan and set aside. Combine beans, applesauce, maple syrup, cocoa powder, vanilla, sugar or stevia, baking powder, baking soda and salt in a food processor or blender and blend until smooth. Stir in oat flour and chocolate chips. Pour batter into the pan. Bake for 30-32 minutes or until brownies are set. Allow to cool before cutting into squares. Oh man, I was mentioned by name in your blog and didn’t even know it! I will have to take a look at these recipes and give them a try! I am making your Honey Beans and Spinach tomorrow! I know, it has been a long time since you gave me the recipe, but better eat late then never! Love you! Feel free to call me when you find something I might like!